When describing kanban implementation most information resources merely reference it without explaining it in technical terms or providing implementation details. 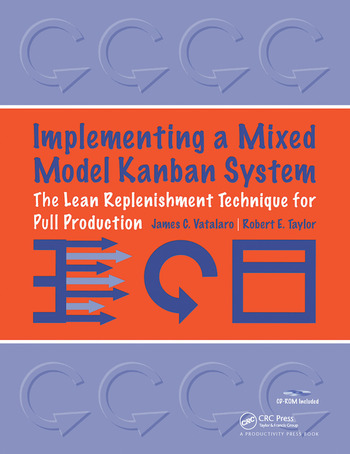 Authors James Vatalaro and Robert Taylor address the need for kanban implementation guidance in Implementing a Mixed Model Kanban System: The Lean Replenishment Technique for Pull Production. Implementing a Mixed Model Kanban System is a comprehensive and in-depth guide to implementing a kanban within the value stream. Its plain-language approach provides step-by-step coverage and guidance of the implementation, metrics, and dynamics of an effective kanban system based on proven reliable methods honed through years of implementation experience within manufacturing and non-manufacturing environments. By focusing on a case study of a manufacturing company trying to create and maintain continuous flow in their value stream. 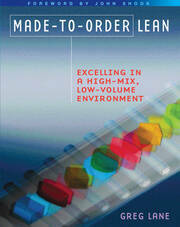 Vatalaro and Taylor show the reader how to construct their own kanban process, from beginning to end. This book carefully identifies and explains each of the components of a kanban system within the context of pull production. The authors' common sense approach makes this book an excellent "on the floor" resource for all levels of "lean learners." In addition, a CD-ROM is included, containing the spreadsheets and forms discussed in the text. Chapter 4: Some Tools to Help You "Go-Do"
"The book illustrates the step-by-step kanban implementation process through a case study of a fictitious golf club manufacturer...a CD-ROM containing spreadsheets and forms discussed in the text is included". "Chapters explain the principles of kanban in plain terms, tools for applying and managing the system, and frequently asked questions. Simple diagrams, sample charts, and plain language clearly outline the basics in this valuable resource for any business manager or production overseer looking to take advantage of the structure and principles of kanban." "...lean manufacturing experts Vatalaro and Taylor provide step-by-step guidance on the implementation, metrics, and dynamics of an effective kanban system within the value stream. Their approach is based on their experiences in manufacturing and non-manufacturing environments. By focusing on a case study of a manufacturing company, they show readers how to construct a kanban system from beginning to end." "...A 124 page workbook by experts James C. Vatalaro and Robert E. Taylor, clears misunderstanding about Kanban, a system for controlling production and replenishment throughout its entire value stream...The method can be used by any company seeking to lower costs by better control of their processes."